A pot of grass brings the promise of spring indoors. You can grow grass as a snack for your pet or just to brighten up your home. Grass grows quickly and requires little care. 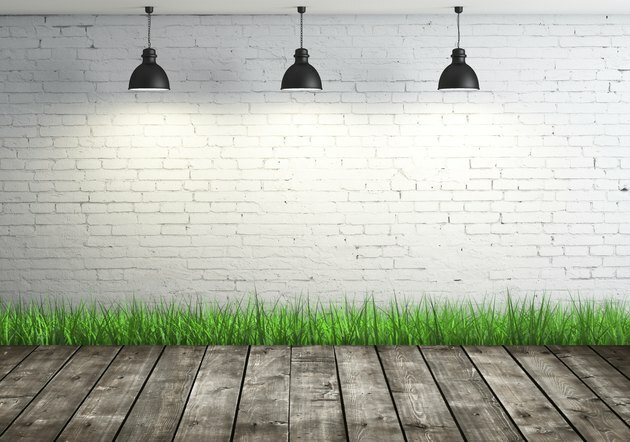 The type of grass determines how long it will live and how much maintenance it will need, but almost any type of grass can thrive indoors for at least a short time. Combining grass varieties provides additional textures or shades of green. Although most grass seeds can germinate indoors, some varieties grow the quickest and need the least care. The seeds of ryegrass (Lolium multiflorum) and tall wheatgrass "Jose Select" (Elytrigia elongata "Jose Select"), both hardy in U.S. Department of Agriculture plant hardiness zones 3 through 9, germinate within seven to 14 days of being sown, and the resulting plants grow for at least two months. Ryegrass and tall wheatgrass are common in "pet grass" seed mixes, which you can substitute for ryegrass or wheatgrass seeds. Perennial tall fescue (Festuca arundinacea), hardy in USDA plant hardiness zones 4 through 7, also germinates and grows quickly. Tall fescue forms a feathery, soft mat, but it requires regular care and maintenance if you want it to survive more than a few weeks indoors. Outdoors, it is considered invasive in some locations. Containers ranging from pots as small as 3 inches wide to large trays are suitable for growing indoor grass. Large, 4- to 6-inch-deep trays work well for pet grass and for growing a larger mat of indoor grass while small pots work better for windowsill plants or for just adding a touch of green inside. Soak pots, trays and their drip pans in a solution containing one part bleach and nine parts water for one-half hour to disinfect them, and then let them air-dry so the bleach evaporates from their surfaces. Each container needs at least one bottom drainage hole, but large trays need multiple holes. A drip pan beneath each pot or tray protect will your indoor surfaces from water drips. Any sterile potting medium works well for grass, which can grow in any rich soil that remains moist while draining quickly. A thick seeding results in a full pot of grass. Overcrowding isn't a concern with grasses. Sow the seeds in a single layer over the top of the moist soil, leaving almost no space between the seeds. Pressing the seeds lightly before covering them with a 1/4-inch layer of soil ensures they are in full contact with the soil during germination. The seeds germinate quickly when placed in a warm area that receives all-day sunlight, such as near a south-facing window. Mist the soil surface with water daily so the soil doesn't dry out. Grass seeds won't germinate in dry soil. Indoor grass requires little maintenance beyond regular watering, sunlight and an occasional trim, but some fertilizer helps it remain green and growing. Water the grass when its soil surface begins to dry out. Any water that drains into the drip pans needs immediate emptying. The grass will be OK if you don't overwater it, but root rot can occur in soggy soil. Although the grass could be allowed to grow tall, keeping it trimmed prevents it from going to seed. When the grass grows beyond 4 inches tall and you don't want it to produce seeds, wipe scissors with a cloth that was soaked in rubbing alcohol to disinfect them, and then remove up to one-third of the grass' height. Applying diluted fertilizer every two weeks in place a regular watering will keep perennial grass green and growing. Mix 1/2 teaspoon of water-soluble, 24-8-16 fertilizer in 1 gallon of water, and water the grass with the solution until it just begins to drip from the bottom of the plant containers.